A bay or bow window makes a perfect space for adding a window seat. Bay and bow windows can improve a room dramatically with extra volume, light, and space. By installing bay or bow replacement windows in your home, you can transform your living space on an affordable budget. Home Solutions Midwest installs quality bay and boy replacement windows from Renewable by Andersen. They can easily be installed in place of conventional flat windows, making your bedroom, your living room, or your home office look like new. If you're thinking about installing or replacing a bay or bow window in your home, call us at 1-844-665-0388 to schedule a free estimate for your project. Why choose bay or bow windows? Bay windows are an elegant choice for almost any living or working area. Adding a three-dimensional window gives you more space, more sunlight, and a classic, elegant look. If you don’t have the budget for a complete home remodel, a set of bay windows can give you a beautiful transformation at a relatively low cost. Once the windows are installed, maintenance and cleaning is easy. By installing our replacement windows, you can enjoy the advantages of energy efficient bay and bow windows while enjoying a luxurious look. All our products are 100% satisfaction guaranteed. Our window experts and installation crews are here to guide you through every step of the process, from the initial consultation to the final cleanup. Do bay windows or bow windows sound like a good choice for your home? We’re ready to talk with you about the possibilities. Get in touch with Home Solutions Midwest today. 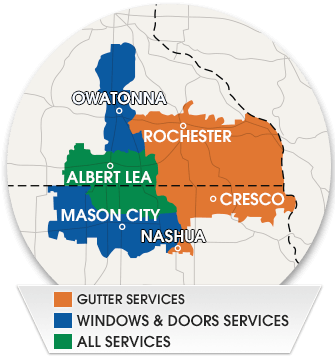 We offer free design consultations and estimates in Rochester, Northfield, Mason City, Owatonna, Winona, Faribault, Austin, Northfield, Albert Lea, Farmington, and throughout Southeast MN & Northern IA.